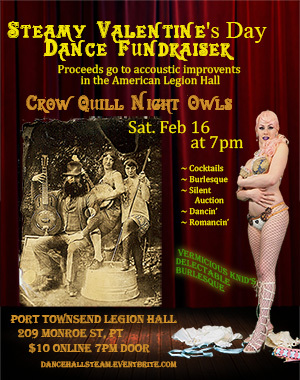 Steamy Valentines Vintage Dance Hall Fundraiser to support the Port Townsend American Legion Hall. Help us raise $2000 to upgrade the acoustics at one of our favorite venues. Catch the Crow Quill Night Owls and get steamy with a little cupcake burlesque show. Olympic Peninsula Steam was founded to educate about the amazing history of our region. That history is a rich component of life here. If offers a unique opportunity to celebrate, learn and grow. Along the way we've come to realize we're about community and contributing to our home. OPS has helped support and sponsor a host of regional non-profits and organizations. Olympic Peninsula Steam sponsors a series of events through the year. Victorian Yuletide Festival - a Victorian-style parlor to put in a good word with Father Christmas. Savor tasty snacks and help deck the halls performers sing, play and recite all your holiday favorites. December. On November 17th, 2013, Olympic Pensinsula Steam was recognized as a public charity giving the organization non-profit/exempt - AKA 501 (C) (3) - status by the IRS.